Title reference "Jack and the Beanstalk"
Live-action segment "Bats in the Basement"
"Mario and the Beanstalk" is the seventh episode of The Super Mario Bros. Super Show!. Its corresponding live-action segment is "Bats in the Basement". Mario, Luigi, Princess Toadstool and Toad climb the beanstalk. Inside a cottage, Mario, Luigi, Toad, and Princess Toadstool are attempting to think of a way to gain one hundred gold coins by the morning of the next day; without these coins, the Mushroom Kingdom Orphanage would be forced to close, evicting all the orphans who live in it. As Princess Toadstool makes some suggestions, they are rebuffed by Mario and Luigi, who say she had already sold her jewels and mortgaged the cottage. Princess Toadstool, frustrated, tells Mario, Luigi and Toad to think of something. Before Mario, Luigi or Toad can say something though, they are interrupted by a nearby cow wearing a crown, who is eating some hay rather noisily. Noticing the cow, Princess Toadstool makes the sad decision of selling it, as it is the royal cow, it would be worth a lot. Taking the leash of the cow, Mario and Luigi leave the cottage, as Toad, who knows how the used cow market works, begins to worry that Mario and Luigi may mess-up in selling the cow. At a cow lot, Mario and Luigi offer their cow to the swindler salesmen, Dealin' Delbert, wanting money. Ignoring this comment, Dealin' Delbert tries to persuade Mario to trade their cow for a rather old and sickly-looking one. Refusing the trade their cow for this other one, Mario and Luigi tell Dealin' Delbert they want one hundred coins. Hearing this, Delbert decides to offer Mario and Luigi a deal for their cow, one they cannot refuse. At the cottage, Princess Toadstool and Toad are horrified to discover that Mario and Luigi traded the royal cow for three, small garbanzo bean seeds. Mario, showing Toad and Princess Toadstool the garbanzo beans, is severely reprimanded by them. After scolding Mario, the Princess sneezes, being allergic to garbanzo bean seeds; this sneeze causes the beans to be blown out a nearby window. After the seeds are blown outside, Toad says that the next day he'll go to town and try to get the royal cow back from Dealin' Delbert. After Toad says this, Princess Toadstool decides that now would be a good time to get some some sleep. As Mario, Luigi, Toad and the Princess go to bed, the garbanzo bean seeds, which had landed in the yard of the cottage, suddenly take root in the ground and begin to grow into a monstrous beanstalk, which grows high enough to reach the clouds. The next morning, Princess Toadstool is saying goodbye to Toad, wishing him good luck in trying to get the royal cow back from Dealin' Delbert. Saying he'll try his best, Toad begins to leave, only to notice the giant beanstalk in the yard. Asking why Toad has suddenly stopped, Princess Toadstool notices the beanstalk and her gasp of surprise upon seeing it summons Mario and Luigi, who stare in awe at the beanstalk. Seeing the beanstalk, Mario gets an idea, the garbanzo beans growing on it can be harvested and sold for coins which can be donated to the Mushroom Kingdom Orphanage; thinking Mario's plan to be a good one, Luigi, Toad and Princess Toadstool follow Mario to the beanstalk to help him pick the beans. Later, after having climbed extremely high on the beanstalk, Mario tells Princess Toadstool, Toad and a hesitant Luigi that they should start plucking garbanzo beans from the top of the beanstalk and then work their way down. Hearing Luigi's plea that perhaps everyone should go back down to the ground, Mario agrees, when he suddenly hits what appears to be a stone ceiling. Confused, Mario pushes upwards on this ceiling, removing one of the stone blocks constructing it, making a passage. Climbing up the passage, Mario, Luigi, Toad and Princess Toadstool find themselves in what appears to be a giant-sized kitchen. Luigi, at first curious about the giant kitchen, decides to travel back to the cottage after hearing that someone or something colossal must live in the castle; before Luigi can enter the passage back to the beanstalk though, the block that originally covered it falls back into place, blocking the passage. Grabbing hold of the fallen floor panel, revealed to be a trapdoor, Luigi, Mario, Toad and Princess Toadstool begin trying to lift it, only to fail, the trapdoor being too heavy. As Luigi begins to bemoan his and his friends' fate, a booming voice echoes through the room; recognizing the voice as King Koopa's, the Princess, Mario, Luigi and Toad begin trying to open the trapdoor again, as King Koopa, having become gigantic in size, draws nearer. As Mario, Luigi, Toad and the Princess struggle in vain to open the stuck trapdoor, King Koopa appears and mockingly proclaims that he is preparing a stew, with Mario and Luigi as the main ingredients. Going over to a large oven, King Koopa begins to stir a pot on it as Mario, noticing a nearby door being open a small amount, beckons Princess Toadstool, Luigi and Toad to run towards it. King Koopa, seeing Mario's group running towards the door, promptly pulls a nearby cord hanging from the ceiling; as this cord is pulled, a metal cover slides down over the door, blocking their way out. Seeing an open window, Mario, Luigi, the Princess and Toad begin to run towards it, using a pile of logs as a stairway to it. Reaching the top of the logs using several long jumps, Mario finds to his dismay that the window is still too far out of reach; seeing the Mario group's predicament, King Koopa begins to laugh at them. As King Koopa mocks him, Mario, seeing a nearby fireplace poker, has Luigi help him grab it and maneuver it under the window, making a somewhat unstable ladder. As Mario and Luigi begin arguing over who should climb the fireplace poker first, Princess Toadstool and Toad simply decide to do it and begin to run up it; unfortunately, as they reach the window sill, King Koopa simply pulls another nearby ceiling cord, causing a cover to drop over the window. As King Koopa begins to walk towards them, the Mario Brothers see a bellows lying on the ground. Jumping down on to the bellows as King Koopa grabs a panicking Princess Toadstool and Toad, Mario and Luigi spray King Koopa with a cloud of dust blown from the bellows. Enveloped by dust and ash, King Koopa begins to cough and sneeze, causing him to drop the Princess and Toad. Landing safely near Mario and Luigi, the Princess and Toad run quickly towards an open door while King Koopa is still enveloped by smoke. Passing this large door, Mario, Luigi, Toad and Princess Toadstool find themselves in a room filled with mountains of gold coins. As they stare in amazement at a rather large pile of gold coins, the door behind them is slammed shut by King Koopa, who says they'll never be able to escape this room. Sticking his head through a hole at the top of the door, King Koopa says that soon Mario, Luigi, Toad and Princess Toadstool will be crushed by coins and proceeds to command a goose hanging from a cage attached to the ceiling to lay several coins. As King Koopa flees, the goose in the cage suddenly asks Mario for help in escaping from King Koopa as it lays dozens of coins. Asking why he should help it, Mario gets the response from the goose that if he helps it escape from its cage, it will show them a way out of King Koopa's castle. Deciding to trust the goose, Mario climbs the mountain of coins and bends apart the bars of the goose's cage, making an opening large enough for the goose to exit the cage. Sliding down the coin mountain, the goose explains to Mario that King Koopa had captured it and had been forcing it to lay coins with a magic spell. After the goose explains its story to Mario, it shows him the exit it mentioned earlier, a nearby, small opening created when the garbanzo beanstalk burst through the floor of the room. Moving some coins covering the opening, Mario, Luigi, Toad, Princess Toadstool and the goose climb down the crack and begin to descend the Garbanzo beanstalk. Unfortunately, King Koopa, having seemingly noticed that they are missing, had summoned various Hoopsters to guard the beanstalk. Seeing Mario's group, several Hoopsters begin to charge towards them; as the Hoopsters draw closer, Mario, grabbing several large garbanzo beans, begins rolling and throwing them at the Hoopsters, knocking them off the beanstalk. With the Hoopsters gone, Mario's group manages to safely descend the beanstalk and return to the cottage below. On the ground, Luigi, after grabbing an axe, begins to chop down the beanstalk while the goose asks Mario, Toad and Princess Toadstool how it can repay them for saving it. As Luigi continues to chop the beanstalk down, Mario asks if perhaps the goose can give them some coins they can donate to the Mushroom Kingdom Orphanage, unfortunately, the goose responds that only King Koopa and his magic spell can make it lay coins, without the spell, it can only lay eggs and offers Mario one; refusing the goose's offer, Mario watches as Luigi finishes chopping down the beanstalk. As the beanstalk begins to fall, King Koopa's castle falls with it, becoming damaged. As the castle and beanstalk fall to the ground, the gold coins inside of it begin to rain down on top of Mario, Luigi, Toad, Princess Toadstool and the goose, much to their delight. King Koopa, his castle having crashed into a pond, drags himself ashore, only to discover that the water he was drenched in has shrunken him to about the size of Toad. As Mario, Luigi, Toad, Princess Toadstool and the goose laugh at him, King Koopa runs to the hills, vowing revenge. After laughing, Mario, Luigi and Toad discover that they're quite hungry; hearing this, the goose begins trying to lay some eggs for them, only to discover she can only lay golden eggs, much to her surprise. When King Koopa grabs Princess Toadstool and Toad and laughs, Princess Toadstool's crown looks exactly like King Koopa's crown. 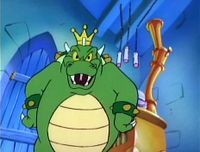 Official summaries of this episode refer to King Koopa by the name of Giant Koopa, though the episode itself does not actually refer to him by this name. 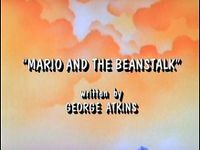 This episode is a parody of the fairy tale "Jack and the Beanstalk," even taking such elements as a beanstalk, a gold-laying goose, a giant and the main character(s) trading a cow for beans from the story. 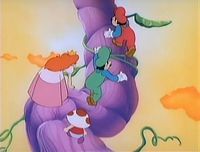 Mario, Luigi, Princess Toadstool and Toad climbing up the Beanstalk could be a reference to the ones from Super Mario Bros..
King Koopa's enormous size later appears in the episode "Mario Meets Koop-zilla" and "Princess, I Shrunk the Mario Brothers". It also appears in games, such as Super Mario Galaxy 2 and Mario Party 10. This is one of the three episodes where King Koopa wears a costume, but not an alter ego, the other two being "Jungle Fever" and "Mario of the Apes". Mario clearly says in the beginning that they need 100 gold coins by the next morning or the orphanage will close. The group then enters the castle the next day, so the orphanage would have closed by that point. This page was last edited on February 18, 2019, at 16:23.